YOU MAY ALREADY have heard – and if not, you’ll probably come across the news soon – that today, January 16, is the ‘most depressing day of 2012′. This stems from a formula concocted by a part-time tutor at a college in Wales, who put together variables including the weather, debt, the time since a Christmas holiday, and general motivation. Its author, Cliff Arnall, declared the formula to be as it’s pictured here – with W standing for weather, d standing for debt, T standing for the time since Christmas, Q representing how long it’s been since your New Year’s Resolution fell apart, M being motivation and Na being a person’s “need to take action”. Even if you accept the status of each of those variables – that is, you acknowledge that each of those points has a bearing on how depressed you might be on any day of the year – there is one fundamental problem with the formula (aside from the fact that D, apparently, isn’t defined as standing for … anything). Put it this way: how do you measure the temperature – does the formula assume we’re dealing in Kelvin or Celsius? Do we have to convert into Fahrenheit – or use some other grade (marks out of 10 between absolute zero and the boiling point of steel)? Likewise, how is ‘debt’ measured? Euro? Cent? A percentage of GDP? Then we move onto the TQ – the time since Christmas, raised to the power of the time your New Year’s resolution failed. Again, assuming that each is measured in days (no doubt, it doesn’t), this is where any mathematical stress-testing of the formula would wane. The reason today (or, depending on who you believe, next Monday) is called ‘Blue Monday’ is because it’s assumed that motivational levels are at their lowest on a Monday – and that when coupled with debt, weather and the urgent desire for a holiday, a Monday in January is therefore the most miserable. Here’s the problem though. Ignoring the myriad other failings in the concoction, most of the important variables are measuring the wrong thing. 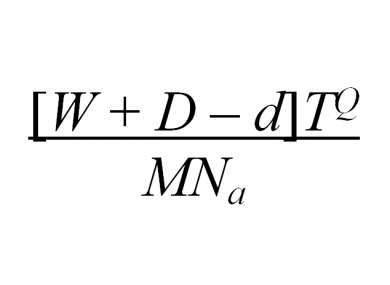 The formula includes ‘weather’ rather than coldness (don’t higher temperatures make us happier? ), ‘d’ for debt is a negative value (surely debt should add to one’s misery, and not detract from it?) and ‘M’ is motivation, rather than demotivation. And that’s the problem with TQ – the number of days since Christmas, raised to the power of the number of days since your New Year’s Resolutions were abandoned. For the sake of an example, let’s pretend today is Christmas Eve, and generously assume that your New Year’s Resolutions survived until February 1. Therefore, it would be 364 days since Christmas, and 326 days since your resolutions bit the dust. 364326 is roughly equivalent to 10830 – quadrillions of quintillions of times larger than the number of atoms in the universe. Therefore, no amount of ‘motivation’ or ‘need to take action’ could possibly drag the number down: if you believe in the formula, then the most miserable day of the year is Christmas Eve. Do you feel more depressed today than on Christmas Eve? "We're the MTV generation." "We feel neither highs or lows." Note: If you are feeling under the weather today, don’t suffer in silence – call the Samaritans at 1850 60 90 90 or email jo@samaritans.org. The UK’s Mental Health Foundation has put together some tips on helping to improve your mood if you feel low. Email “Is today the most depressing day of the year?”. Feedback on “Is today the most depressing day of the year?”.